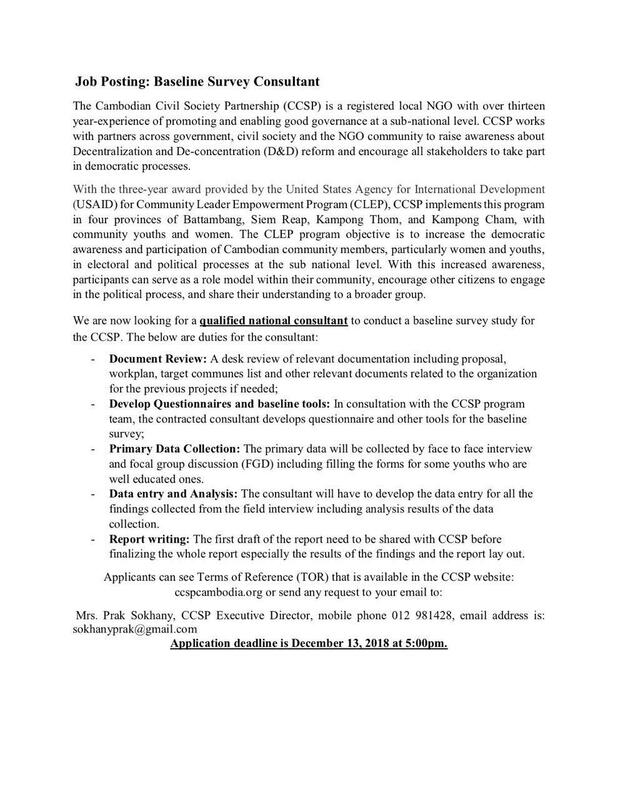 The Cambodian Civil Society Partnership (CCSP) is a registered local NGO with over thirteen year-experience of promoting and enabling good governance at a sub-national level. CCSP works with partners across government, civil society and the NGO community to raise awareness about Decentralization and De-concentration (D&D) reform and encourage all stakeholders to take part in democratic processes. With the three-year award provided by the United States Agency for International Development (USAID) for Community Leader Empowerment Program (CLEP), CCSP implements this program in four provinces of Battambang, Siem Reap, Kampong Thom, and Kampong Cham, with community youths and women. The CLEP program objective is to increase the democratic awareness and participation of Cambodian community members, particularly women and youths, in electoral and political processes at the sub national level. With this increased awareness, participants can serve as a role model within their community, encourage other citizens to engage in the political process, and share their understanding to a broader group. Primary Data Collection: The primary data will be collected by face to face interview and focal group discussion (FGD) including filling the forms for some youths who are well educated ones. Data entry and Analysis: The consultant will have to develop the data entry for all the findings collected from the field interview including analysis results of the data collection. Application deadline is December 13, 2018 at 5:00pm. Room 27, Building D, Department of Local Administrator, Ministry of interior, Khan Chamkar Mon, Phnom Penh.